Let me just say that I was perfectly happy with my whole food plant based lifestyle prior to owning a Breville Smart Oven Air Fryer. Having said that I must admit that an air fryer really is a game changer because you can make so many amazing oil free foods in it. I didn’t realize how much I love crunchy foods! I have a convection oven and it does a pretty good job on oven fries but the Breville takes it to a new level. 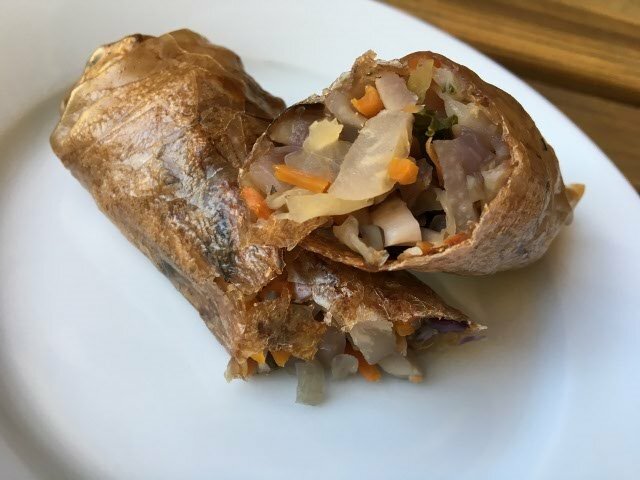 For instance these crunchy, crispy spring rolls are not only vegan and gluten free but they are made without any oil! It’s almost too good to be true but when you bite into them and hear the “crunch” you will be a believer too. 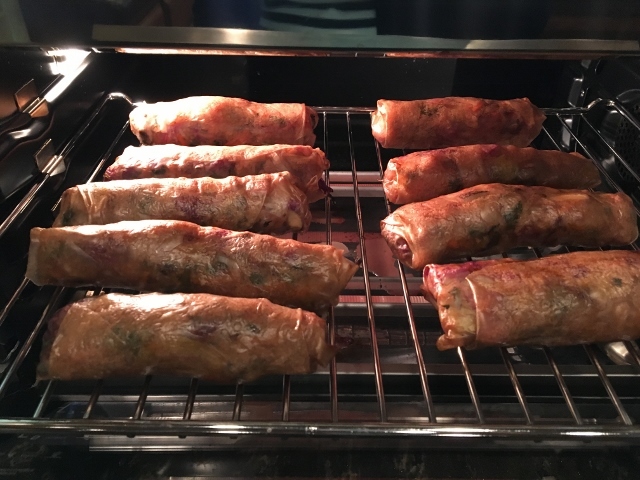 In September when my dear friend Shayda Solameni was here visiting for the weekend she came up with the idea to try and make a crispy spring roll in my Breville Smart Oven Air. I just happened to have all the ingredients including brown rice wrappers which are vegan, gluten free and fat free. We sauteed up a bunch of veggies with garlic, onion and ginger and we were thrilled with the results. I have since made them a couple more times and they are absolutely delicious! 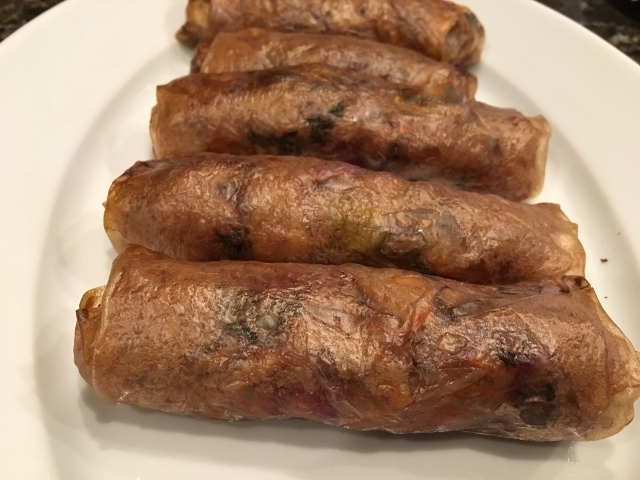 They taste like an egg roll but without any of the fat or gluten. Thank you Shayda for a brilliant idea! I don’t know if you can get the same results in the oven or a convection oven because I haven’t tried but it sure does work well in the air fryer. This is what I used for the spring roll filling the last time I made them. It was what I had in the fridge at the time and I didn’t really measure anything – I just filled my skillet with the ingredients shown above and let them cook down. Of course I started with a small red onion and water sauteed it. Then added in the mushrooms, about a tablespoon of chopped garlic and a heaping tablespoon of fresh chopped ginger and cooked until they were soft. Then the cabbage, carrots, cruciferous crunch, bamboo shoots and water chestnuts. Cook it until soft but not mushy. This is important – you have to let the filling cool down – I put it in the fridge until it was just room temperature. If you use the filling when it’s hot it will make your rice wrappers too moist and they won’t get crispy. Use a little bit of water when sauteing to keep it from sticking to the pan and put the lid on to steam it a little but you don’t want it to be too wet. Be sure to cool the filling to room temperature before filling the wraps and rolling them. You can find these at Whole Foods, Natural Food Stores and some Asian Markets. 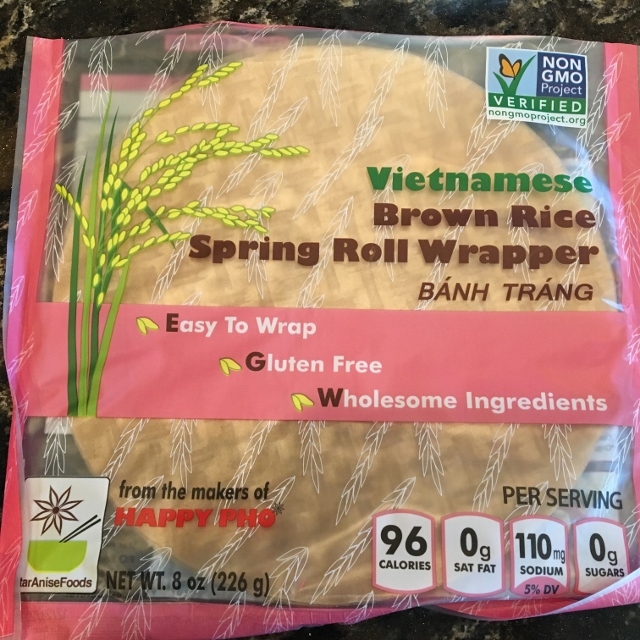 I like the brown rice wrappers they are sturdier than their white rice counterparts but use the ones you can find. These are also available on Amazon Prime if you can’t find them locally. 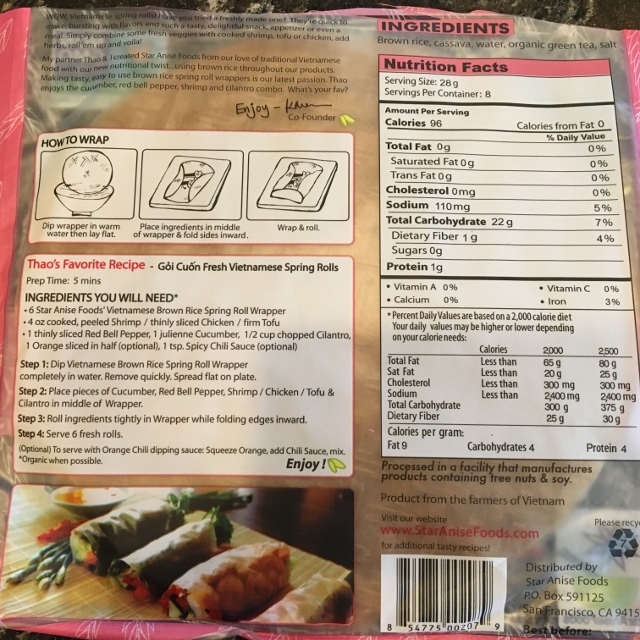 Please note that the nutritional information is “per serving” and one serving turns out to be 3 rice wraps. I usually eat 3-4 of the spring rolls so its really a nutritional bargain! Yes they are processed and have added salt but I only eat them maybe once a month – it’s not something I have every week. They are a fun treat to enjoy with the family. The rolling technique is the same as for the Fresh Spring Rolls Video that I made previously. If you need to see exactly how to roll them watch that video and you will see how easy it is. The first couple of them that you roll might turn out a little strange but hang in there and keep trying because it gets easier and they get prettier once you find your groove. Fill a big bowl with warm not hot water for dipping the rice wraps in. You don’t leave them in the water it’s more of a dip in the water and let the excess water drip off. If the water gets cool dump it out and replenish with warm water. Pre-heat the Breville Smart Oven Air fryer to 400 degrees. You will notice that I am not using the Breville air fryer racks for this. It seems to work better and stick less to the regular racks that also come with the oven. Do not try to move the spring rolls or turn them over once you get them on the rack as they will stick and tear. Leave them in for the full 20 minutes and check them to make sure they are crispy enough. Oh my goodness you guys they turn out crispy – crunchy and the taste is amazing! Adjust the amount of ginger and garlic to your taste. Only make the amount you can eat fresh as they will not stay crispy. We don’t need any dipping sauce for them as they taste delicious just as is. Of course you could use a little rice vinegar on them – I like the one from Trader Joe’s because it is sodium and sugar free. You could serve these up with a side of brown rice and some steamed veggies for a wonderful Asian meal. 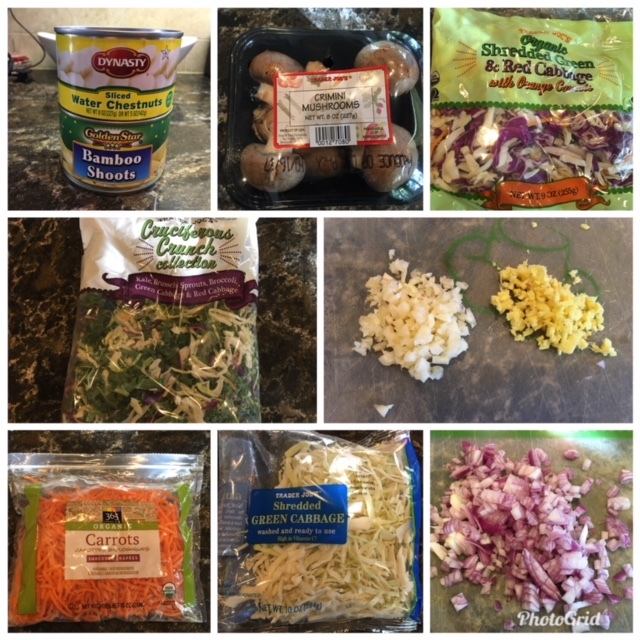 Note: You don’t have to use exactly the ingredients I used you can use what ever veggies you have on hand or can find at your grocery store. I have made them three times and used slightly different ingredients each time and they turn out wonderful every time. I think a little Chinese Five Spice would be nice in the filling mixture but I keep forgetting to buy any. Heat up your skillet and water saute the onion until translucent, add the mushrooms, garlic and ginger, saute for 2-3 more minutes before adding the rest of the ingredients. Add a little bit of water if you need to keep it from sticking to the pan. Put the lid on to steam the vegetables just don’t let them get too wet. You want the mixture to be cooked but not soggy. The filling needs to cool down before you try to fill the rice wraps. I put the mixture in the fridge to hurry along that process. Once it is cool then proceed. Dip one rice wrap at a time in the warm water, just dip it in, pull it out and let the excess water drip off. Place the rice wrapper on a clean cutting board, it will continue to soften as it sits there, add a scoop of cooled down filling, fold over the sides of the wrap, then start rolling it up, set aside and start making another. Preheat the air fryer to 400 degrees. For this recipe I don’t use the Breville Smart Oven Air fryer rack – just use one of the regular racks that comes with the oven – there is less surface area for it to stick to and it seems to work really well. Set the timer for 20 minutes. Don’t try to move the spring rolls or turn them over as they will stick and come apart. At 20 minutes check to make sure they are crispy and remove them using a pair of tongs. When cool enough to eat – enjoy this oil free crunchy treat! 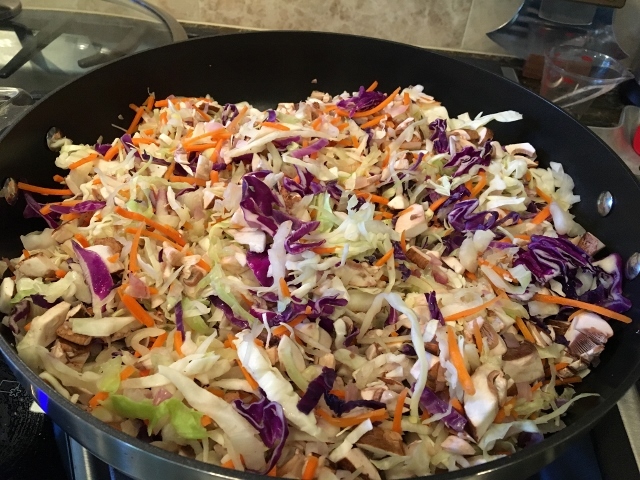 Serving idea – serve with steamed brown rich and steamed vegetables. If you have filling leftover enjoy it heated up and served over a bed of rice or quinoa. 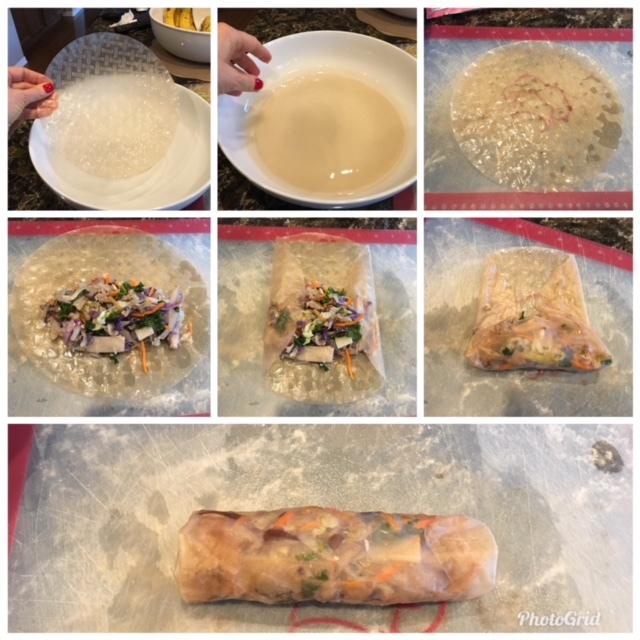 To see rolling techniques watch my video Fresh Spring Roll Wraps. To learn more about the Breville Smart Oven Air fryer watch my video. To purchase the Breville Smart Oven Air Fryer from Amazon. Some links are Amazon Associate links and by using them you help support this site with no additional cost to you. Thank you for your support.